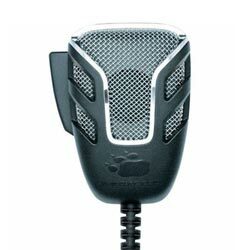 Sorry, the 5000B10 is discontinued. 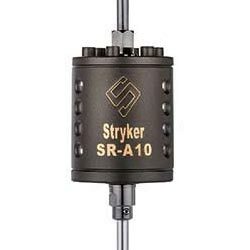 Extensive research, development and engineering efforts showed that a silver plated 3/16" solid copper wire displayed better performance characteristics and lower losses, giving more power gain, than that of chrome plated hollow tubing. 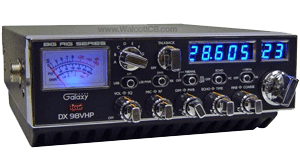 Copper is one of the best RF conductors available, silver is even better. Wilson combined the best of both worlds by choosing 100% pure silver for heavy duty plating of the large solid copper wire. 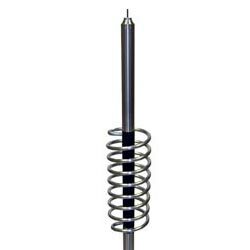 This combination provides better efficiency and higher performance properties, thereby giving more power gain than any 1/4" or 3/8" chrome plated tubing antenna coil. The special design of the Trucker 5000 floating coil will not ice up and stop working or break, even in severe winter conditions. 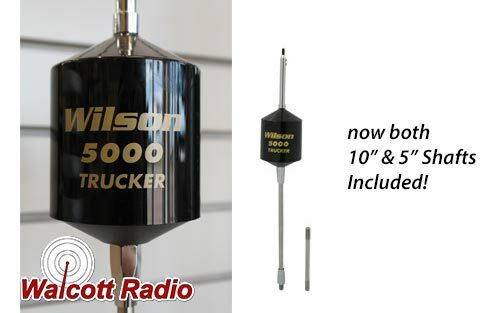 This means that using Wilson's design techniques, the 5000 Trucker will not ice up and short out the windings as is possible with the open coil designed antennas. The highly engineered thermoplastic cover protects the coil from the harsh environmental conditions encountered on the open road. A dirty antenna coil can measurably cut the performance characteristics of that antenna, and one that is covered with ice can cut the performance by as much as 50%. 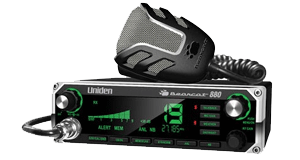 The Trucker 5000 was designed specifically for users who want the best in a high performance antenna with the ability to withstand some serious power. 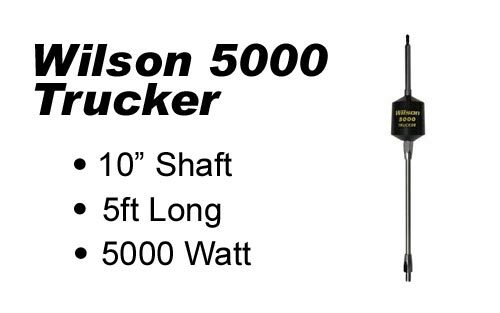 The Wilson 5000 Trucker handles 5000 watts AM, 20,000 watts SSB (ICAS rating).